Our old, faithful scantron machine has graded its last contest. FFA has designed us a new card to be used with their grading machines. 4-H students participate along side FFA students and will therefore use this card also. The workflow will be the same as in past contests in that students will fill in bubbles on cards and we will scan them. There are two distinct differences between this year's card and previous cards: layout and handling. Past policies of unacceptalbe marks and erasures remain in place. 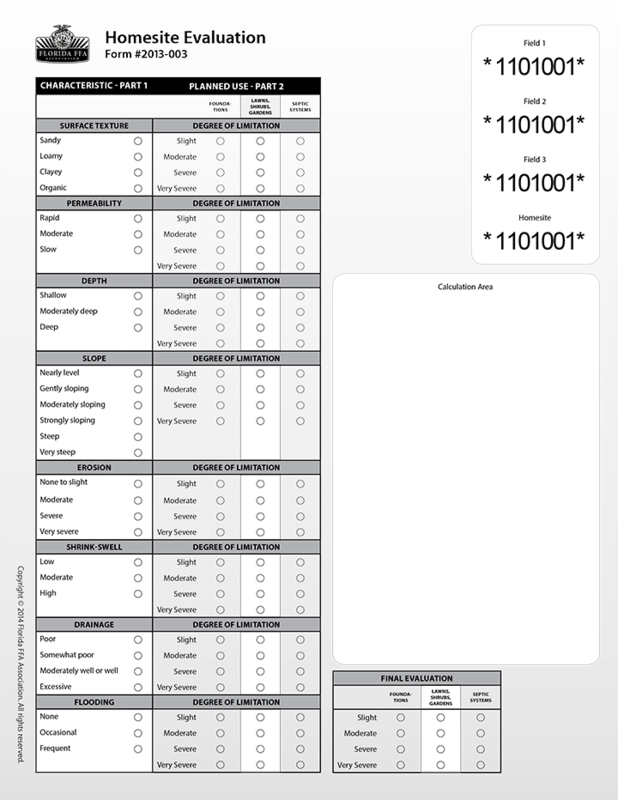 We have combined both sides of all three land judging cards into a single side of a score card. The catagories and order of information are identical to previous cards. 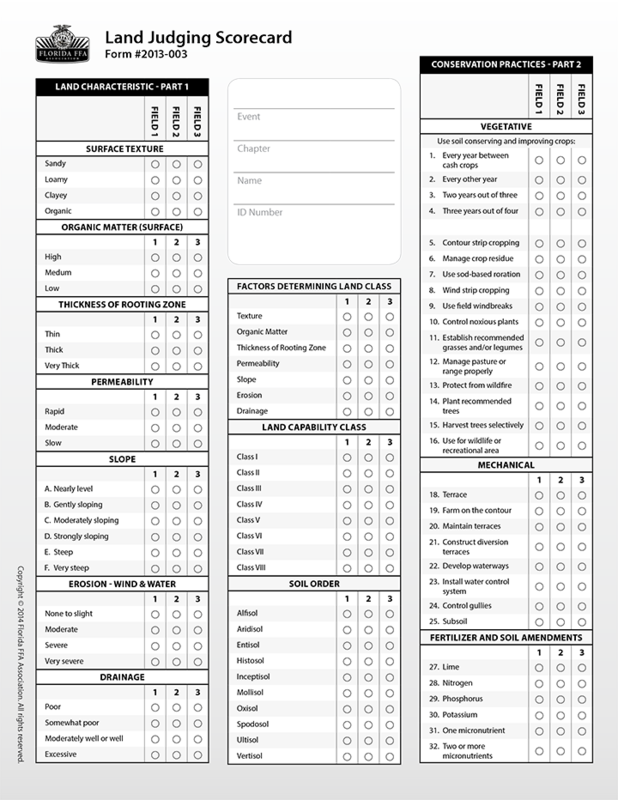 This new card has a more efficient layout where the questions/catagories are only printed once along with three columns of answer bubbles, one column for each site. The homesite layout is also compressed as we were able to combine the front and back of the homesite card onto the back side of the new score card. Also on the back side is a large area for erosion calculations for all four sites. Students will retain their cards for the entire contest. At the end of their last site, they will submit their cards to their group leader. A scorecard runner will bring the cards back to the grading room while Ellis reviews the sites with the students. Grading will hopefully be quicker than previous scantron years. As in the past, students may only make marks for slope calculations and a roman/arabic number for the student's best possible capability class each landscape catagory at each site. See page 3 of the PDF below for an example of those capability class numbers. In contrast, page 4 has an excellent example of numbers that are similar in context, but their aim is to serve as notes or reference so the student doesn't have to remember what is written in the manual. THE MARKS ON PAGE 4 ARE NOT ALLOWED. Stray marks such as those indicated on page 13 are no longer a challenge for the new scanners so those will be of little concern to students now. Please note the 2013 version is here for reference only. We will no longer use this version.